"One can imagine a film other than in the form of a story. We must try to widen the limits of expression." absolutely free that your very existence is an act of rebellion." Arriving roughly in the middle of Miklós Jancsó's career, Még kér a nép/Red Psalm is arguably his most well-known film after Szegénylegények/The Round-up and Csillagosok, katonák/The Red and the White (also available from Second Run). Widely regarded as his best work, it also cemented his reputation as one of Hungary's most important and influential filmmakers. From the film's earliest moments, it's easy to see why that is. Poetic in style and radical in vision, Red Psalm is not a film for everyone, and has polarised opinion ever since it's release. In the simplest of terms, it lays down a challenge: watch me, follow me, unravel me, find my truths and learn what you will. Unless well-versed in the work of Jancsó's countrymen, Béla Tarr and Zoltán Huszárik, or indeed, the 'slow cinema' of Andrei Tarkovsky or Nuri Bilge Ceylan, it will be unlike anything you've experienced before, or, I'd wager, are likely to again. However, if you're a long-time cinephile, and an aficionado of any and all of those directors, it has much to offer, purely because it shows what cinema can achieve when it dares to test its limits. Red Psalm is not a film where everything is laid out neatly in easy to follow fashion, not does it adhere to the cast-iron rubric of classical narrative structure. That's one of the many things that makes it so special. The foundation bookends of beginning and end are, of course, intact, but as for everything else, it's open to interpretation (to that end, a plot summary is included in the accompanying booklet for a point of reference). Known variously as 'Red Song' and 'People Still Ask' – a derivative of its original Hungarian title, 'Yet the People Must Keep Demanding,' itself borrowed from a Sándor Petöfi poem* – Red Psalm is inspired by the Hungarian revolutionary uprisings of the 19th century (including the Hungarian Revolution of 1948, which Petöfi was involved in), chronicles the revolt of a group of farm labourers, who, buoyed by the efforts of their comrades elsewhere in Hungary, attempt to stage their own bid for freedom. Drawing heavily on folklore and other popular songs (including 'La Marseillaise' and 'Johnny, My Darling', a.k.a 'Charlie, My Darling'), music is used as the primary mode of expression - dialogue is sparse, but meaningful. As a result, the film is often described as a musical, but that's rather reductive, and doesn't do it justice. If you look hard enough, you'll see echoes of Chaucer's Canterbury Tales and Ingmar Bergman's The Seventh Seal in its medieval pageantry; and Segei Eisenstein's Battleship Potempkin and Strike, in its style and representation of the workers as archetypes. Constructed from just 28 shots, the pace of the film takes some getting used to, particularly for contemporary viewers conditioned by the breakneck speed and visual assault of fast editing. In Jancsó's world (and of Tarr and Huszárik), you can breathe, truly take in the images you're being presented with and think about what they mean. Everything unfolds with a balletic level of grace that draws in the viewer and holds the attention, despite the film's pacing. There's no time for the eye to wander, because there's too much to take in. 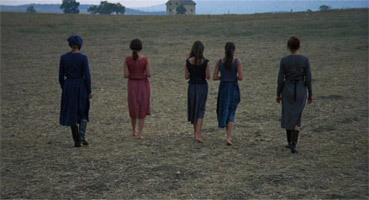 Jancsó first used long takes in Oldás és kötés/Cantata (which contains just 12 shots in all), made over a decade before Red Psalm, and heavily influenced by Michelangelo Antonioni's La Notte/The Night. Over time, this approach became an integral part of Jancsó's aesthetic, and it reaches its height in Red Psalm. However, Jancsó insists his reliance on this style has nothing to do with art or technical skill, but rather, the opposite, seeing them as a cost-cutting measure, and a way to overcome his concerns about his own editing abilities. Modesty aside, to my mind, such decisions are not only a hallmark of a director who possesses a great amount of skill, but also one who possesses a great deal of confidence in their material, and the story they want to tell, highlighting the technique isn't more widely adopted. Red Psalm is cinema at its most difficult, playful, and brave. Beautifully composed though it is, Red Psalm is no antiquated relic, despite coming from, and speaking about, another time and place. Just as there is pleasure in the visual, there's pleasure in movement too. The peasants, like the soldiers, are a bonded unit, and move as such, doing everything together; whether dancing, with their arms linked in the ultimate symbol of brotherhood, or praticising marching drills. 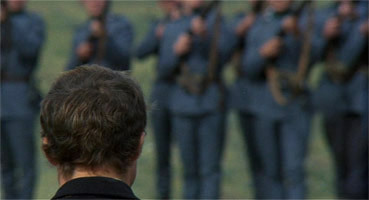 The mise-en-scène of the film is executed with the same level of precision, with up to 1,500 people involved in the elaborate set pieces where the soldiers and the workers confront each other. The sheer scale of the world Jancsó presents is extraordinary. 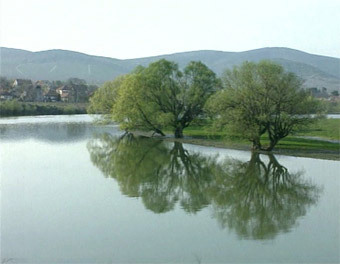 The film takes place entirely outside – a common feature of the director's work – and the open space is used to the fullest, making for an incredibly rich viewing experience, as far as the eye can see and perhaps beyond it. In an otherwise natural palette of greens, browns and greys, the colour red, for obvious reasons, weighs heavy with symbolism, whether shown in the injuries of battle; in red rosettes of defiance or the red shift dresses of them women, it's presence is as big a battle cry as any of the peasants' songs, as loud as any warning sign shot fired from their military oppressors. Red Psalm is a powerful film of great energy and passion, that tells the story of a particular historical moment. We glimpse one battle in the wider war for social, cultural, and political freedom, fought in the hope for a brighter future. In Jancsó's hands, it's also a story you aren't likely to forget. A handsome 1.85:1 anamorphic transfer that boasts the sort of picture detail you'd think DVD had no right to display in the age of Blu-ray. The contrast is – as so often with second Run releases – absolutely spot on and the colours are lively without any sense of over-saturation. A few dust spots remain, but for the most part the picture has polished up wonderfully. There is a faint narrow faded vertical strip on the extreme right of frame, but this is in no way distracting and is consistent enough to ignore if you do spot it. The restored Dolby monbo 2.0 soundtrack has a dynamic range appropriate to its age but is otherwise clear, well balance and free of noise, damage or distortion. By now, the reputation of Second Run releases is such that it seems superfluous to state what treatment they afford every title, since every one is lavished with the care that is usually reserved for discs given the 'special edition' label, and this is no exception. Along with a director-approved transfer, showcasing restored sound and image, you'll find improved subtitle translation. Add to that the fact that this release marks its introduction into the English-speaking world, and it makes for a very attractive package indeed. As extras go, they don't get better, or rarer than this. If owning the film itself isn't enough for you, then I'd argue that the mere presence of the documentary on this release is reason enough to purchase. 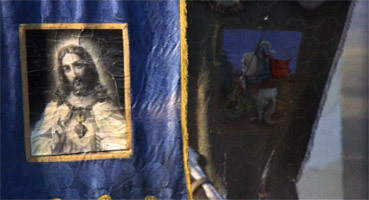 Hegyalja/Foothills is the third film in Jancsó's renowned, but rarely seen 1994 documentary series, A kövek üzenete /Message of Stones (the two other films in the series dedicated to Budapest and Máramaros respectively, can be found in the extras for Second Run's other Jancsó titles, The Red and the White and My Way Home). Featuring music from the Great Old World Band, this carries all the stylised hallmarks of the director, and is beautiful to look at as a result. Jancsó and his cameramen weave around the Tokaj-Hegyalja wine region (located between north-eastern Hungary and Slovakia; originally named Hegyalja); part tourist, part traveller, moving through the region. Beginning in Tarcal and ending in Olaszliska, they pick up everything around them; people, landscapes, faces and textures, encompassing everything from a parachutist in the sky, to tiny insects scuttling along the top of a headstone. The focus here is on the visual, but far from feeling superficial, it retains an a level of intimacy, honesty and authenticity that documentaries often lack. Discussion, when it occurs, is fleeting, but powerful, particularly during a long sequence where we meet a family, visiting the grave of their grandfather at a Jewish cemetery in Bodrogkeresztúr. In many ways, it feels like we're looking through a keyhole into another time and place, as well as another country, briefly glimpsing its many facets. The open spaces and empty, decaying buildings lend the film a haunting quality, but there are moments of great national pride and sheer joy captured here too. Hegyalja deserves to be seen by a much wider audience, and thanks to this release, it can be. This beautifully presented booklet, illustrated throughout its 20 pages, is dedicated entirely to an essay on Red Psalm by Peter Hames. As regular readers of this site, and indeed regular purchases of Second Run releases will know, Hames is a frequent contributor. For those new to his work, it'll be easy to see why he's become so renowned within a few sentences. This is a treat for fans of his and of Jancsó's alike. Hames writes with authority, clarity, and a great deal of passion as he explores, in close detail, the style of Jancsó's work, his ideologies and influences. Using Red Psalm as a focal point, there's a diverse range of references peppered throughout the piece, providing different perspectives on Jancsó over 30 years, from the early 1970s, following the film's release, right through to mid 2000s. A fascinating and engaging read. Along with useful notes for further reading and production credits, you'll find a full plot synopsis, included for reference, which you may want to skip over until you've seen the film for the first time. Also included is a catalogue card showcasing a selection of recent releases, including Zoltán Huszárik's Szindbád/Sindbad, Miloš Forman's Lásky jedné plavovlásky/A Blonde in Love, and Miguel Gomes' Aquele Querido Mês de Agosto/Our Beloved Month of August. This is Miklós Jancsó at the height of his powers. Red Psalm is a beautiful film, one laden with symbolism and a powerful message that resonates even now. Intricately woven together with virtuosic skill, Red Psalm shows, in no uncertain terms, what can be achieved when cinema frees itself from the conventions of genre. An extraordinary piece of filmmaking that demands to be seen. *taken from Raymond Durgnat's detailed piece on Red Psalm in Rouge magazine, which you can read in full here.